Fort de la Rivere (site of the French internment camp of the same name which held British military personnel between March and October 1942) is situated just north of Eze and west of La Turbie (Alpes-Maritimes). It lies in the hills between Monte Carlo (to the east) and Nice, and is less than two kilometres from the Mediterranean. Details of the mass breakout by British servicemen from Fort de la Rivere in September 1942 are readily available from the literature – notably “Detachment W” by Derek Richardson and “RAF Evaders” by Oliver Clutton-Brock. However, the documents needed to describe what happened immediately after the escape weren't available when Derek wrote his 2004 book, and Oliver was writing about airmen rather than the many soldiers who were also involved, so I have posted this article to try and fill in some of the gaps. I suggest that readers wishing to know why the internees were held there, more about the background and build-up to the escape, and what happened to the internees afterwards, should consult both publications. “The escape took place during the evening of 5 September 1942. The RAF sergeants who were to take part in the escape had to be hidden in the eastern wing of the fort before nightfall because that was when the night gates between the two parts of the fort were locked. The escape groups formed up and from about 4.30 onwards, they passed through the tunnel and down onto the floor of the moat. In all, 58 men managed to get away …"
25 out of the 58 men who escaped that night managed to evade recapture and were returned to the UK within weeks. They were brought out by sea from the French coast direct to Gibraltar (rather than across the Pyrenees) on board the Polish crewed felucca Seawolf - all but two (Goulden and Owen) on Operations Titania and Rosalind from Canet Plage near Perpignan – see Article for more details of those two operations. Sgt Melville H Dalphond RAF (907) says that he led the first party through the tunnel and that his companions were Sgt Robert Saxton RAF (893) Pte J Shields (Gordons) Pte T Hayes (RA) and one other (Pte L Andrews (963) – see later). The second party was led by Sgt John McLarnon RAF (LIB/628) with Sgt R D Porteous (Wellington W5421) and four ORs. The third party was led by Sgt Douglas Walsh RAF (915) with RAF sergeants Alan Mills (929) Dedman (Lancaster L7548) and Nichol Birkett (LIB/1306) plus Cpl Arnold Howarth (933) a commando from St Nazaire. The fourth party was Sgt Stanley Browne RAF (890) leading Sgt Cyril Mort RAF (LIB/1727) and three or four ORs, with other parties to follow if time allowed. The first (Dalphond's) party was directed to the Villa Nina in Nice (or alternatively the garage off rue Meyerbeer) the second to Monastery Leghet (Sanctuaire de Notre Dame de Laghet) (or alternatively the Villa Nina) the third to Monastery Leghet and the fourth party to rue Meyerbeer (or Villa Nina). Any subsequent parties (no-one knew how many men would be able to leave the fort before they were discovered) should aim for one or other of the above addresses. I suspect the contact off rue Meyerbeer was Rene Sainson of nearby rue Barralis. Dalphond and party left the fort at 1800 hrs and reached La Trinite Victor by nine that evening where they spent the rest of the night in the open, overlooking the village. At dawn they set off for Nice, keeping off the roads and at nine o'clock, Dalphond split the group into three, giving each a rendezvous point of a hill-crest about a mile away, above St Andrew (query) where they met successfully and then split again to meet overlooking the river Var, about two and a half miles away. Dalphond and Saxton reached the second rv but not the others [Andrews (963) says he and Donnelly (906) had a similar experience – see later] and so they carried on to the Villa Nina. Three guides set off in search of the missing men but only Donnelly was found – the others weren't heard from again. They stayed in one room at the Villa Nina for nine days, where a Pole named Klies (Leonard Klik at 14 rue Halevy) fed and clothed them, until being taken to the garage off rue Mayerbeer and on to the railway station. They went by train to Marseille (arriving 1500 hrs on 15 September) where they were met by Pat O'Leary who took them to a flat (no details). Three days later, they were moved to Louis Nouveau's fifth floor apartment at 28a Quai de Rive Neuve, overlooking the the Vieux Port (neither Dalphond or Saxton are recorded by Nouveau as staying there), where they were formed into parties with guides for the journey to Perpignan and it was Val Williams (Vladimir Bouryschine) and another guide who took them to a villa at Canet Plage before embarking on Seawolf the night of 21 September. Cpl T Baird (904) (4 Bn Seaforths) was the last of the party (query) to get through at 2015 hrs. The others were recaptured but Baird made his way alone to an estaminet (café) in Nice where he heard English spoken. He stayed there overnight and then met a Dutchman who sheltered him for three days while French identity papers were being prepared and contact made with an organisation. Baird was passed from house to house until 10/11 September when a guide took him to a rendezvous where he joined six other escapees. They (he doesn't specify who) were taken in batches to the station and then by train to Marseille where they were met by Patrick O'Leary. O'Leary arranged their accommodation and later took them to Perpignan and then by tram to Canet Plage. Dvr Robert Donnelly (906) (RASC) doesn't say who he left Fort de la Rivere with, simply stating he went to the restaurant Grand Blue (sic) in Nice and that with help from Gaston Valenciennes (of the Bar Diana on Blvd Gambetta) and Patrick O'Leary, he reached Marseille. From that point, he was with Cpl Baird (904). L/Cpl Thomas Owen (905) (Royal Welch Fusiliers) says he was making his fourth escape from the fort, although this one was better prepared. He doesn't name anyone else in his party but Pte James Goulden (903) (East Lancs Regt) says that he escaped from the fort with Owen (again) and that his account is the same. They were supposed to go to an address in Monte Carlo but the presence of guards searching for escaping prisoners meant they had to spend their first night on the side of a hill. Next morning, they - I am guessing that Owen and Goulden had become separated from the rest of their group by this time - approached the Belle View Hotel at Cros de Gagnes on the (correct) assumption that spelled like that it might be under English management. The owner, Mrs Germaine Abbott, gave them food for two days while they hid in the garden of the house next door. Meanwhile, Mrs Abbott contacted the American Consul (presumably in Nice) but for various reasons, he was unable to help so they decided to make their own way to Grenoble. They got as far as Saint-Jeannet where they were advised to to go to M Mercier's café from where they were directed to an American named Wilcox at Antibes. Unfortunately, Mr Wilcox refused to help so they went by bus to Cannes and then train to Marseille and the American Consulate where they saw the consul, Hugh Fullerton. He sent them to a Greek doctor (Georges Rodocanichi) at 21 rue Roux de Brignoles where they stayed for three days and were visited by a man who brought them clothes etc. The same man also pointed out a Pole known as Ted Alwast who they were to follow next day. Accordingly, they were led to a tram terminus and taken by tram to the sea at the Calanque de Sormiou where they - and evader L/Cpl James Wilkie (902) - were picked up by a fishing smack. They joined “about 60 Poles and a Czech (sic) woman” on board the felucca Seawolf. Five men who had escaped from Fort de la Rivere on 25 August : F/Lt Frederick Higginson (872) F/O Brian Hawkins (879) F/Lt M G Barnett (887) Sgt Derrick Nabarro (891) and Sgt Henry Hickton (894) - eight RAF evaders : S/Ldr Harold Outram (864) P/O Leslie Wilson (880) F/Lt Henry Holliday (881) P/O R E W Wood (882) Sgt Gilbert Foster (883) F/Lt Gordon Fisher (889) Sgt Ellis Charman (892) and Sgt Francois Kula (901) - and three French Canadian soldiers who escaped from a train after capture at Dieppe : Pte Conrad Lafleur (884) Pte Robert Vanier (885) and Pte Guy Joly (886). Sgt Douglas Walsh RAF (915) says it was Whitney-Straight who gave the escapers the addresses they were to go to, although this seems unlikely as Whitney-Straight had escaped in June from the Pasteur Hospital at Nice and was collected from St Pierre Plage near Narbonne by HMS Tarana the following month. Walsh's party – Sgt Alan Mills (929) Sgt Leslie Pearman (928) Cpl Arnold Howarth (933) and Dvr Francis McFarlane (970) - left at 1920 hrs and spent three days in the mountains before reaching the monastery at Laghet where they had been told that the Abbe would help them. However he was too frightened and it was a young farmer called Claude, who worked land adjoining the monastery, and an Italian who worked with him, that gave them food and shelter. Walsh gave Claude the address of the garage in Nice and contact was made with Anthony Friend, an Australian working with the Monaco police. Meanwhile, they were joined by Gnr John Moran (957) Pte Robert Cameron (960) and Pte Duncan Livingstone (962). On 11 September, an unnamed Frenchman sent a guide to bring them from Laghet to Monte Carlo where they (but not Pearman) stayed with hairdresser, Mme Guiton. Meanwhile, Tony Friend contacted Pat O'Leary and on 22 September, O'Leary took them to Marseille. After two days at Louis Nouveau's apartment (where they are recorded as visitors 128, 130 and 131) Cameron, Mills and Walsh were taken to Toulouse to be sheltered by Paul and Imelda Ulmann (presumably in the villa at 39 rue Pierre Cazaneuve which Paul Ulman rented especially for that purpose). On 3 October, they were brought to Canet Plage where they stayed (at the Hotel du Tennis) until boarding Seawolf on 12 October. Sgt Alan Mills RAF (929) escaped with Walsh (915) Pearman (928) Howarth (933) and MacFarlane (970) but recalls events slightly differently. They had instructions to go to the Monastery Laghet, which they reached on the morning of 7 September after a night in the hills. However they received no help there and so stayed another three days in the hills under the care of a young French worker who contacted the organisation on their behalf. On 10 September, a guide led them across the mountains to the home of Mme (Germaine) Serocold on the golf links near Monte Carlo. Mme Serocold gave them a good meal and at 0400 hrs (11 September) they went on to Roquebrun (Roquebrune-Cap-Martin) where Mills says that Pearman remained (see later) while the rest of the group went to a block of flats in the rue Marechal Petain (formerly rue Grande Bretagne). They were lodged in an empty flat and looked after by Mme Guiton and an Australian named Friend. On 22 September, Mills left with Walsh (915) and Pte Cameron (960) for Marseille where they stayed with Louis Nouveau (as visitor numbers 128, 130 and 131) for two days before going on to Toulouse. On 3 October, they were taken to Canet Plage with Pte Smith (954) where Mills (and presumably the others) stayed until embarking for Gibraltar on 12 October. Sgt Leslie Pearman RAF (928) confirms they had instructions to go to the Monastery Laghet, which they reached on the morning of 7 September after spending a night in the hills. Unfortunately they received no help there and so stayed another three nights in the hills, looked after by a young French worker. With the latter's help, they were picked up by the organisation and on 10 September, taken over a mountain pass to Monte Carlo. While the others were moved elsewhere (see Mills) Pearman was sheltered with M et Mme Bos de Glarelial at 40 Boulevard d'Italie, Monaco where he stayed until 24 September. After eight more days at another flat, Pearman was taken (with others) to Marseille and Louis Nouveau's apartment, where he is recorded as visitor number 139, arriving on 2 October. Two days later, O'Leary “directed” him and others to Canet Plage, where they stayed until 12 October. Cpl Arnold Howarth (933) (2 Commando) gives few details in his report, saying only that he was with Walsh (915) Pearman (928) and McFarlane (970). He is recorded as arriving at Louis Nouveau's apartment on 2 October as visitor number 140 and so it seems probable that like Pearman, he stayed in the Monte Carlo area until shortly before their departure for Canet Plage. Dvr Francis McFarlane (970) (RASC) confirms that he left in the third party along with Walsh (915) Pearman (928) Howarth (933) and Mills (929). They had been given an accommodation address and proceeded to Mme Guiton's flat at Monte Carlo. After about two weeks, McFarlane left for one night in Nice before O'Leary took him to Marseille. MacFarlane is recorded as visitor number 142 at Nouveau's flat, arriving on 3 October, the day after Pearman and Howarth. From Marseille, he (with others) was taken to Perpignan and Canet Plage where they embarked for Gibraltar on 12 October. Gnr John Moran (957) (RASC) left the fort with Cpl Turner (LIB/771). They went to a monastery near La Turbie (Notre Dame de Laghet) where they spent one night before the Abbe asked them to leave. That evening, they split up – Moran going with Pte Robert Cameron (960) and Pte Duncan Livingstone (962). The three men stayed in the general area until the following evening (query) when they joined Sgt Walsh (915) and his group and went with them to Monte Carlo. Moran was with Pte Parker (956) from this point and they and Livingstone are recorded as arriving at Louis Nouveau's flat on 2 October as visitors 137, 138 and 141. Dvr Clarence W Croucher (952) and Dvr Kenneth H Griffin (953) (both AASC, AIF) were in a party of five soldiers and two airmen. They were supposed to go to the Hotel des Touristes in Eze but the other men in the party were caught by gendarmes. It took Croucher and Griffin five days to reach the hotel (which is less than two kilometres from the fort) where the owner took them to stay with an Englishman in the village. Two days later, two men from the organisation took them to Nice where they were hidden in a flat on rue Verdi. After ten days in Nice, a former Polish officer and a Polish priest took them to L'Auberge des Moules (sic) at Cros-des-Cagnes (just west of Nice) where the owner, Margaret Benson (Mme Marguerite Letellier) hid them for about a fortnight. They were collected by a French-Canadian Squadron Leader (Pat O'Leary) who took them to stay overnight in Marseille (no address) before going on to Perpignan and Canet Plage. Pte John Parker (956) (RASC) left the fort with Sgt Miller RAF (LIB/1510) and six (query) others. He says that they were the last party to leave (at 1915 hrs) but other reports contradict this. They spent the first night in the woods and next morning, Sgt Miller split them into two parties. 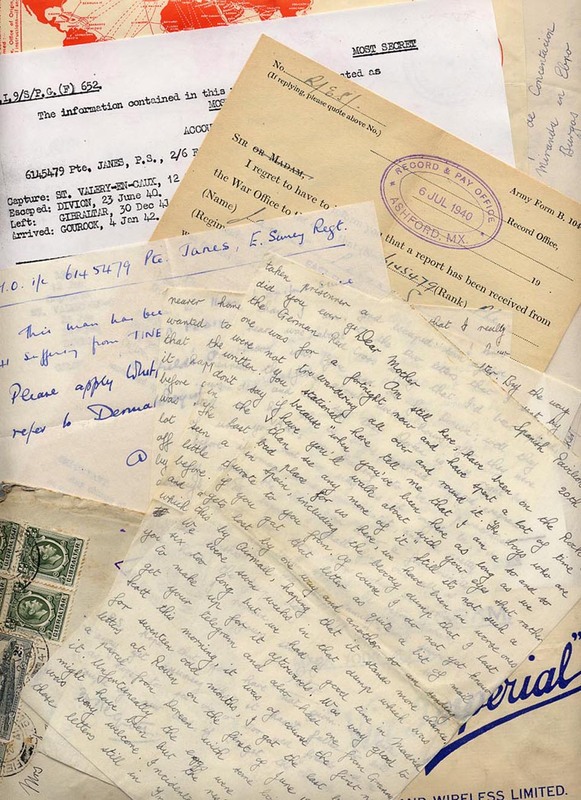 Miller headed for Nice while Parker led his group - Pte Michael Donnelly (958) Pte Thomas M'Kay (961) and Spr L L Lines (967) - to Monte Carlo and an address given him by Miller – Miss (Eva) Trenchard (of 41 Boulevard des Moulins) at the Scotch Tea House. Miss Trenchard telephoned Tony Friend of the Monaco police and he took them to an empty flat where they stayed, looked after by Miss Trenchard and hairdresser, Mme Guiton. They were a month in Monte Carlo until being taken to stay overnight (2 October) at Louis Nouveau's apartment in Marseille (where they are recorded as visitors 137, 138, 143 and 144) before going on to Canet Plage. Pte E MacDonald (959) (1 Bn Glasgow Highlanders) was in “Sgt Dedman's party” and says that after leaving the fort, they split up. MacDonald, Browne RAF (890) Dvr A H Wallis (969) and Pte J J Smith (954) walked to Nice that night where they were sheltered by M et Mme (Rene and Lucie) Sainson at 7 rue de Barralis for seventeen days (Browne left for Marseille after about a week) before being taken to Toulouse on 22 September. MacDonald gives no further details but Wallis (969) says that a man called Robert (query) took him (and presumably the others) to Toulouse. He was sheltered with a Jew and his American wife (Paul and Imelda Ulmann) until 5 October when a guide took him (or them) by train to Perpignan and Canet Plage. Pte L Andrews (963) (5 Bn Gordons) left the fort with Dalphond (907) Saxton (893) Donnelly (906) (evacuated on Operation Titania) Shields and Hayes (both recaptured). He says a rendezvous was decided but only he and Donnelly turned up (compare with Dalphond earlier). Andrews went to the nearest house and asked for help and the Italian occupants contacted the American Vice-Consul. The Vice-Consul arranged a meeting at the Café Grand Blue (sic) on the corner of Premenade des Anglais (which runs along the sea-front at Nice) where Andrews and Donnelly met the secretary of the Consulate. He moved them to various houses in Nice for about a fortnight (although Robert Donnelly (906) must have left during that time) and then to a hotel outside Nice. After four days at the hotel, Andrews was taken to Toulouse by the organisation where he stayed for ten days before being taken to Perpignan and Canet Plage. Pte Richard Watson (968) who had escaped from Fort de la Duchere on 28 September, PSM Lucien Dumais (932) who had escaped from a train after capture at Dieppe, Pte J McLaren (955) a Glasgow Highlander who had been evading in France since June 1940, and RAF evaders Sgt Thomas Jenkins (916) Sgt Frederick Berthelsen (917) Sgt G Robinson (918) Sgt Douglas Baker (919) Sgt Harold Williams (920) Sgt Donald Southwell (921) Sgt George Daft (922) P/O Denys Boothby (923) P/O L G A Reed (924) Sgt Colin Blyth (925) and F/Lt O R Matheson (927). W/O Nichol T Birkett (LIB/1306) (Lancaster L7548) escaped in a group of six (no names). They had addresses “in the town” to go to for help and split into pairs but on arrival (presumably at the Monastery Laghet) Birkett and his companion were told they could not be helped as a previous party had gone there in daylight and they would be suspect. They set off towards Marseille but were captured by Gardes Mobiles. 44 Sqn Lancaster L7548 (Crum) was shot down on the afternoon of 17 April 1942 and crash-landed near Evreux. Six of the crew evaded to southern France where they were arrested – only W/O H V Crum seems to have been captured by the Germans. W/O Ambrose Cobb (LIB/1203) (Lancaster L7548) says they were given addresses by a Roman Catholic priest, that Sgt John Miller (from his aircraft) had them but didn't tell him what they were. Cobb says he was with seven others (including Miller) that they hid up during the night and divided into two parties of four in the morning. Cobb, Miller, [Dowty] and one other were captured the following evening. W/O Bertram Dowty (LIB/1211) (Lancaster L7548) says he left the fort at about 2000 hrs with seven others. They hid on the mountainside overnight and in the morning, split into two groups – Dowty with Sgt Miller (LIB/1897) Sgt Cobb (LIB/1203) and an Army private. They had been given addresses to make for and were heading towards Nice when they were captured. Pte Thomas J Kelly (LIB/255) (Gordon Highlanders) says the camp leader was Sgt P Allison (RE). Kelly escaped the fort with five other men (not named) and his group of six reached the first rendezvous safely but there were too many men there to be handled properly. He says that the first twenty-five were given further instructions but the remainder were captured by gendarmes when they raided the monastery. Pte Albert Manser (LIB/372) (The Buffs) says they were all given addresses by their officer and that he was directed to a monastery about ten miles from the fort. He reached the monastery three days later but was “pounced upon” by Gardes Mobiles on arrival. W/O John W McLarnon (LIB/628) (Wellington W5421) was making his second escape from Fort de la Rivere – his first, on 21 March 1942, ended after three days when he, Sgt Porteous, Sgt Nabarro (891) F/Lt Saxton (893) and Sgt Dalphond (907) were picked up in Monte Carlo. This time, one of his party (no names given) sprained his ankle and so delayed their arrival at a rendezvous (not stated) and they were picked up by a patrol the following night. 12 Squadron Wellington W5421 (Langlois) force-landed at Antwerp airport the night of 5-6 August 1941. F/Lt Roy Langlois (LIB/831) and W/O Richard Copley (LIB/888) were captured in Brussels but Sgt Jack Newton (649) made a successful evasion via Comete. McLarnon, Porteous and Sgt Harold Burrell (LIB/1664) made it to Toulouse where they were arrested on 13 September. W/O John Miller (LIB/1897) (Lancaster L7548) says they were a party of six (two RAF and 4 Army) and that his companions were Dowty RAF, Lines, Parker, M'Kay and Young (Pte G Young – A&S Highlanders). He says they got split up when they knew Gardes Mobile were about and only Lines, Parker and M'Kay got away. W/O Cyril R Mort (LIB/1727) (174 Sqn Hurricane BE421) says he left in a party of eight, including Sgt Browne (890). After a night in the woods, they made their way to Nice. Mort was following directions given to him at the fort, walking along the promenade and past a certain casino to reach a house when he and his companion, Pte J N Luckhurst (Green Howards) were arrested by four plain-clothed policemen on bicycles. Cfn Harold Pool (LIB/1772) (REME) hurt his ankle during the escape (assume he is the man referred to by McLarnon (LIB/628) above). He says he was helped by the others “who could have made better progress without me but would not leave me”. Pool says they headed for Marseille and were at liberty for three days before being captured by the police. W/O James Saunderson (LIB/1314) (Lancaster L7548) says his group (no details) went to a nearby monastery. They had been sending supplies there to be kept for when they escaped and the padre gave them food while they hid in the garden. Eight other escapees were also there and others had been to the monastery, asking for help. A gardener brought more bread and then took them to a disused flour mill but they were spotted by local people and gendarmes came to arrest them. Pte W Thomas (RCS) was probably in one of the groups as his French wife was one of those who helped organise the escape from Fort de la Rivere. Cpl Alexander Turner (LIB/771) (A&S Highlanders) says he was in a party of eight that made for a monastery about five miles from Monte Carlo. Unfortunately other parties also arrived and they were too many for the priests to handle. Turner and his group decided to make for Nice but French troops were “out in their thousands combing the countryside” and they were caught in the mountains.